There are numerous parking facilities nearby. Grab something to eat and drink at the kiosk and be delighted by the friendly service. Waterpark Alpamare is eqquiped with four large pools (wave pool, jodine- brine- bath, Rio Mare and Alpa bath) as well as ten fun water slides. A great adventure for the whole family. A water temperature of 28°C-30°C (82,4°F- 86°F) and the high waves contribute to a sea like experience. Enjoy a tropical climate all year round. A varying flow speed makes this 100m long outside stream pool a fun experience. Whatever you do either floating on the water or trying to swim against the stream, this pool is pure entertainment. Alpa bath with a water temperature of 28°C-30°C ( 82,4°F- 86°F) is also an outdoor pool. This pool was created for relaxation. Therefore it is equipped with underwater loungers with integrated massaging nozzles and underwater music. In addition there is a waterfall grotto and a cold water pool. 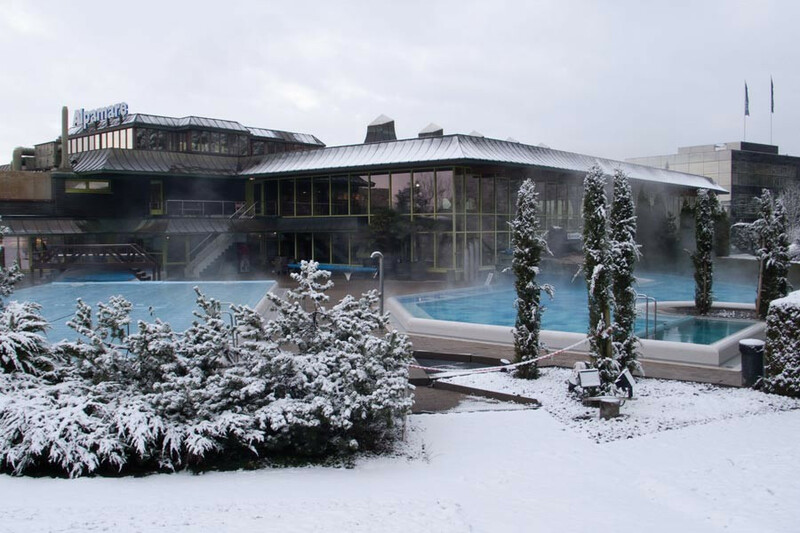 With a water temperature of 36°C/96.8°F the jodine-brine pool is the warmest outdoor pool within the spa. The high concentration of brine has a soothing effect and helps preventing rheumatic pain and discopaties. Jodine-Brine concentrations can also support after surgery treatments. Children under the age 16 are not allowed in that pool. A special highlight of the waterpark, especially for kids, are the ten slides provided. A great adrenalin rush will be caused by the 158m/518ft IceExpress designed after an ice channel as well as the so-called Tornado. The Tornado is a giant funnel in which you spin around in high speed. Also a great experience are the very steep Cobra-Slide and the King-Cone-Slide with a height of 16,7m/55ft. The so-called BallaBalla-Slide (261m/856ft long) on the other hand offers beautiful water and light effects. On this one you slide down on a soft mat, head first, alternating through dark and enlightened parts. Not to forget Cresta Canyon, where you slide on dinghies down a white water channel while younger children may use the less wild Mini Canyon. For an extraordinary experience try the pitch black tunnel slide named Thriller. Simulated explosions, a glass fiber filter and sound effects will make even the bravest person scream. The view across Lake Zurich, which you may enjoy on the spacious lawn with its 200 loungers, is the cherry on top. 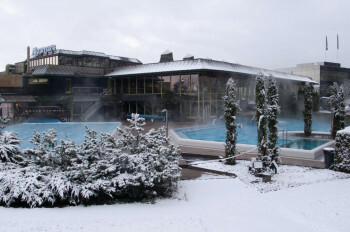 The sauna area of the water park is equipped with six different saunas and two steam baths. The finnish sauna is heated up to 80°C-90°C (176°F- 194°F). The so-called BioSauna, which is a combination of sauna and steam bath, on the other hand attracts with a lower temperature but more humidity. There are seperated women and men saunas. To fully relax and escape your everyday life treat yourself to a soothing massage. Alpamare offers, besides the classical massages like e.g. hot stone, more exclusive ones like a soap-brush massage, which is part of a roman-irish ritual and supports deep pore cleansing. Coming on A3 take exit Pfäffikon/SZ and follow the signs to Seedamm Center and Alpamare towards Pfäffikon. First take the train to Pfäffikon and from there the bus 195 to Seedamm-Center. The bus runs from monday to saturday.